Do you have questions about our Morningstar inverters, or questions about solar in general? Give us a call at 1-800-472-1142. 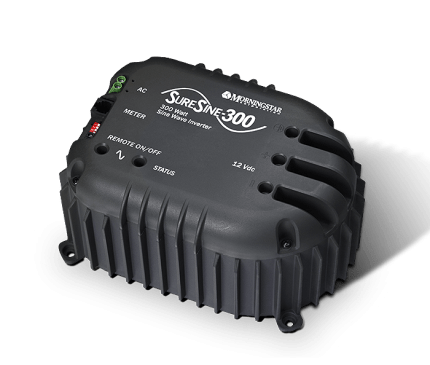 The Morningstare SureSine SI-300-220v is an ideal inverter for small off-grid systems including cabins, RVs, boats, and remote power systems for telecommunications and other off-grid applications. Mornigstar equipment is especially popular in the telecommunications industry due to exceptional reliability, an efficient design, and low radio frequency interference. The Morningstar SureSine inverter accepts 12Vdc input and outputs 300 watts of continuous 230Vac 50hz sinewave power with 600 watts of surge capacity on tap. This is an ideal for applications with relatively small AC power requirements such as lighting in an off-grid home. These inverters are commonly used to power radios and other remote equipment where AC power is needed in addition to 12 volt battery power. Morningstar’s proven track record and robust design of the SureSine 300 ensures years of reliable operation. This version outputs 230Vac 50hz single phase power which is commonly used in Europe, Africa and other parts of the world. If you require 120Vac 60hz power for a system installed in North America, check out the SureSine SE-300-115V-UL inverter. Outstanding surge capability - Handles up to 200% surge during load start-up and a maximum of 600 watts. Morningstar Corporation is a world-leading manufacturer and supplier of solar charge controllers and inverters. Since their inception in 1993, over 2.5 million Morningstar units have been installed in over 112 countries around the world. Morningstar controllers and inverters have set new standards in performance, quality, reliability and innovative features, and global solar markets have consistently recognized Morningstar's products as the industry's best overall customer value. Manufacturing is conducted in a fully-automated, world-class ISO 9001 facility, and quality control includes 100% functional testing on every product, using the latest computerized test equipment and processes. For over 20 years, Morningstar has preserved its ownership, management and strategy, which has allowed the company to build trusted, long-term relationships with its employees, customers and suppliers.